THIS MODEL IS BASED ON AN ORIGINAL ADAMS KIT that dates back to 1958, the year that the Vanguard rocket sent a small satellite into orbit. Mat Irvine: The 1:76 scale kit consists of the sleek Vanguard launch rocket, the launch pad and service tower. To these, add four figures. 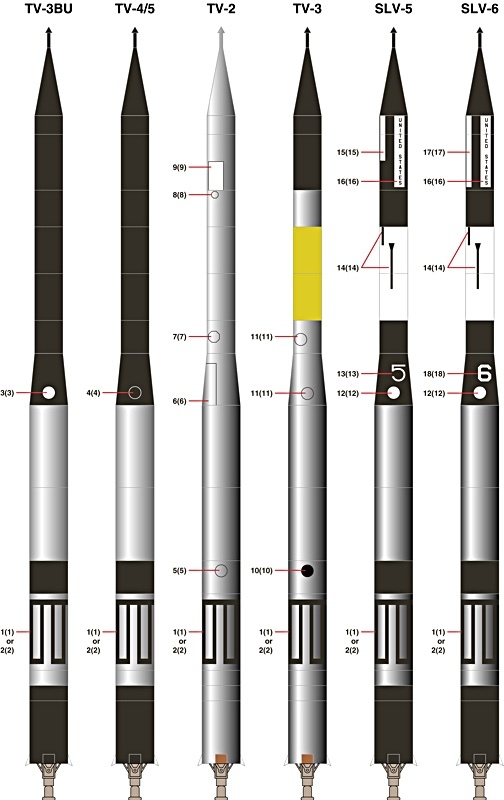 The rocket is the simplest section, consisting of first, second and third stages, each with engine bell detail. The third-stage section can be separated, with a same-scale Vanguard satellite on top, to sit under the nose cone. 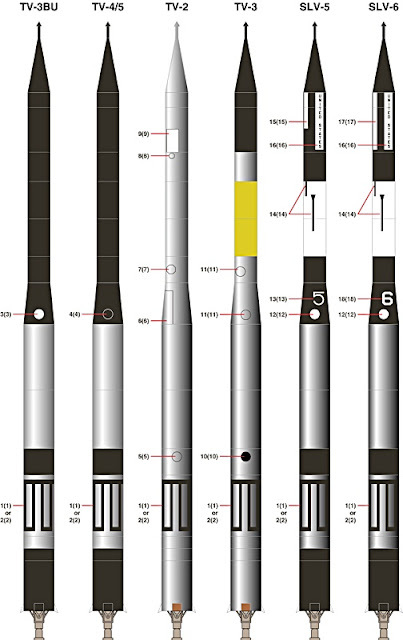 There were 11 Vanguards produced, though only three were successful in launching satellites. The decal sheet provides markings for six of these (actually seven, as two are identical) detailed in accompanying diagrams. The rocket itself is simple in construction, but the launcher setup has far more parts. It is in two sections, the launch pad and service tower. The original Adams kit had these parts moulded in yellow, which is fine for the pad, but the tower should be painted alternate white and red, so obliterating the yellow would have been tricky, as yellow pigment can bleed through many paints. Fortunately, the new Glencoe kit supplies these components in a mid-grey, which is far easier to deal with. However, some work will be required to get the tower correctly painted as it has this the alternating white/red pattern up its entire height. The structure is in six main parts that look identical, but actually they are not, so you need to take care when it comes to sorting out which is which. But once you have identified the parts, it’s best to paint all six before gluing together. First, use a matt-white primer, then spray a semi-gloss white over the top. When all this is thoroughly dry, carefully mask off each section that will remain white, ready to apply the red. This is why it is best to leave all six sections unattached at this stage. If they are glued into their finished triangular shape, you’ll never be able to mask the inner surfaces. This all sounds time-consuming, but once you’ve sorted out the parts, it is a relatively straightforward process. Parts for the launcher and gantry (below). The exact shade of grey can vary from kit to kit, as Glencoe CEO, Nick Argento, says he gets fed up staring at the same shade of grey all the time, and occasional chucks in a handful of green pellets to liven things up a bit! The tower is basically there to hold the pipes that fuel the rocket, and there is an upper cable-arm structure, over which the piping hooks. Below this is a screen, there to catch the falling cables and prevent them from hitting the tower as the rocket lifts off. The original Adams instructions suggest adding mesh and fuel lines, using thread. Today, there is a far wider variety of modelling accessories available. Mesh in various sizes is commonly produced, while thin rubber tubing is more suitable for the fuel lines. But it’s good than even 57 years ago, detailing tips were being provided. The tower is connected to the pad by two girder-like supports. Most of the main launch pad structure is yellow, though the four searchlights are green and the water hydrant pipe-nozzles (part 30) are black. The launch structure itself is metallic, the crane grey, while two boxes are silver. Finally there are four crew figures, which feature an officer, a workman in overalls, and two technicians in fireproof suits. Mesh has been applied (below) to the cable ‘cushion’ frame. Various launch pad components (below) were painted gloss yellow. Old decals (below left) and the new set. Note that you do not get the block colours this time around, which are better painted on, but you do get other markings not supplied with the original. Included drawing (below) shows six Vanguard variants, actually seven as four and five are identical. Note that they are not in chronological order. The correct order runs TV-2, TV-3, TV-3BU, TV4/5, SLV-5, SLV-6, where TV = Test Vehicle; SLV = Satellite Launch Vehicle; BU = Back Up.) TV-4 launched Vanguard 1 on March 17 1958. The fully assembled and finished kit was presented (below) as Vanguard TV-4. Closeup (below) of added fuel lines and mesh. Arguably the fuel lines should hang a little more realistically. Closeup (below) of the launch pad base, showing the included figures. The precise scale of this kit has been debated over the years. Depending on what measurements are taken, and from where, various calculations point towards 1:81. However that isn’t absolute, and the kit 1:76 scale matches the main UK model rail scale, and is close to the most common aircraft scale of 1:72. Interestingly, the original Adams release (above) didn’t give a scale, though many model makers assume it was H0 1:87. This could have been down to the fact that the Thor missile companion kit was listed as being H0 - and the Thor checks out to about 1:85, so close enough. On the original Adams Vanguard box, it just says, ‘Scaled - From Official Blue Prints.’. Glencoe issued it first, though had Adams issued it after Vanguard as the second, and only other, launch rocket kit. The Thor’s launch pad wasn’t really correct, nor was its title Thor at White Sands, as there is no record of one being launched from White Sands, New Mexico. However, Vanguard’s pad and launch tower are correct, as is the name Vanguard at Cape Canaveral as launches were from the US Air Force Missile Test Center (AFMTC) firing range. This separate from the Kennedy Space Center, but both are geographically at Cape Canaveral, Florida. Declaration: I am webmaster for Glencoe, so have close connections with the company. I’ve had the Vanguard built from test shots for some months, and it has featured on the Glencoe website for a similar length of time.